With the Story Album, you can create a digital album for every occasion. 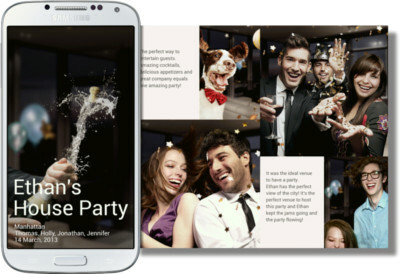 Galaxy S4 can organize your photos and create albums based on specific events or customize them the way you want. You can even apply themes and choose various layouts. Then print the photos and hold the memories in your hand. Album can be created automatically using tag information. Alternatively, you can manually select individual photos to be included in the album. When you take photos at one location, the device automatically sorts your photos into albums based on your specified criteria and suggests making the new albums. To achieve this, tap menu button, go to Settings-Home city, and then set a method for recognizing your location. Select an album type and set a minimum number of photos. When you take photos that meet the criteria you set, the device will suggest making an album. Once the album is created, you can edit it by adding or removing some photos, change the cover photo, modify the layout, and send it to a Samsung printer to print. Of course, you can share and export the album to other devices. The following video illustrates this feature. Q1 : Can I transfer the Story album to the other device after creating the Story Album? A : Yes, you can transfer the Story album as image file, PDF file, Story album file(.ssf) through ‘Share via’. If you are unable to view a Story album you have transferred to another device (that does not support the Story album), you must transfer by ‘PDF file’. Q2 : There is number is displayed in the Story Album icon. I want to delete it. A : It’s a count of recommend albums. When you take a lot of pictures in a day or while travelling after turning on the ‘Event albums’ or ’Travel albums’, albums will be suggested and then the number is created accordingly. Path : Menu key from Album list → Settings → Event albums / Travel albums – here you can disable Event albums and Travel Albums. After pressing ‘Create album’, once you select an item from the recommended album, go to the recommended album list. You can create and delete an album in this list. New and in progress albums in progress make up the count number. Q3 : When I order a photo book in Story Album, I want to order the photo book with a vertical layout. How do I change the layout of photo book in Story Album? You can’t change from a horizontal layout to vertical layout and the layout is fixed. The Galaxy S4 only provides a horizontal layout. How can I add a pic to an already created album? Once the story album is created, you remove, and move individual photos. But I did not find any way to insert a new one into it. Plz note: after opening your previously created album, you MUST swipe thru the first page of pics to activate the menu’s add and delete options. Thank goodness! Could not figure out how to add a picture. Until I found this post. Thank you so much. I just figured this out myself. You are probably using the widget instead of the app. The widget allow you to set up the first album but go into app’s and select story album and you will always have your create album. Makes sense if you think about it. Widgets let you use the app, app’s let you control the app. Hope this helps. The picture will not be removed from the gallery if you remove it from the album. You can still edit individual picture. But probably you cannot extract them out if you delete the original photos in the Gallery. If my pictures are deleted from my gallery can I get them back to the gallery from story album? It depends on your region. Before checking out, you can see the estimated delivery time. Will it delete all pics in it ? No, if you delete the story album, only the album is deleted. The photos in your Gallery should not be affected. How can I move a picture from one page to another page in the album? I’m trying to move a picture that doesn’t fit to another page where it might fit. You can tap and hold the picture, then re-size the part or choose different portion of the photo to fill the space allocated (by the template). I am trying to create my album and I chose only my gallery I want from my photos also and can’t figure out how to get to it again. When creating the album, you are asked the source. Once created, you can “add contents” to each page. This time you can also specify the source of the photos. Tap menu button, you can choose share via. To other S4 devices, you can choose ssf format. Otherwise, you can choose PDF or image. hi…i have created the album and followed the instructions to share, the thing is i only have the ‘share pages’ image file and ‘share album’ story album file as options…the question is how do i get the option of sending it as PDF ? If you choose “export”, can you find the PDF option? How do I set it up so that photos I insert manually are in order of date that pictures as taken? Probably not. You can only choose the frames provided for photos. Hi may I know during story album display how to set music on? Story album is mainly for printing. No music channel. I really hate how i can customize my pages that much. sure you can move the photos around, but it wont let me pick how many photos on one page or reduce or enlarge the size of the photo. it does it all by itself and makes it hard for it to look good. If there is a way for me to control how many images go on a page please let me know. also how do i make a new page? for instance say my current last page has one photo, and i want to keep it like that but add a page after it for other photos. It use theme (or template). So, you cannot really change the layout. You cannot add pages directly, but you can “add contents” when in editing mode. How do you send the .ssf file to another S4 user or email address?? I’ve been trying and even tried using SkyDrive and no luck. The original file size was 32MB but I reduced it to 12MB just to test and nothing. Did you use “share via”? Does story album use up my S4 storage space? If I change to a Samsung note 3 phone and using the same Samsung account will my story album be automatically transferred to my new phone? No, normally the contents of each phone are maintained separately. How do I add pages to the story album? Open the album. Move to the last page. Tap menu key, and you should find “add content” option. In some regions the widgets were removed. Storyalbum only saves photo in its own format. Probably there is no official way to extract individual photo out (to its original state). After a recent update to my Galaxy S4, I now get an error message saying ‘Unfortunately, Story Album has stopped’. How do I make it work again? And what has happened to all my saved albums? Settings–Application manager-all, tap story album app, tap clear cache, tap clear data. Then reboot your S4. Thank you…the app is working but I seemed to have lost all my previously saved photo books, is there any way to get them back? Probably not. Story album manage all their files internally. Normally, you should backup them through Kies or share as ssc file to Evernote or Google drive. Samsung software is not so reliable. Is it possible to add music to story album? The link in the pp is broken in many countries. You need contact local Samsung service centre to see whether the service is available in your area. Im based in the uk. It was available before and I remember the prices coming up before ordering but now its not coming up with any prices at all? My story album unfortunately stopped working how do I fix it? I have tried to change the date and time setting as people discussed in the blog and still not working. Please help. Mine stopped working when I updated samsung. The simple way is to perform a factory reset after updating to kitkat. When I add content it is changing the order of my pictures. I add at the last page and then it puts the new picture in front of the last one and I don’t want it to move. How to I just add pictures at the end? The story album does not provide such options for this. I guess you still have to manually move them. how can i download new theme? You can download new Story Album themes/templates in Samsung apps (now it is renamed as Galaxy Apps). You can search for story album. I made a few albums last year and now they’re gone! I see the title and date of albums but the album is not visible to me..do they delete after some time? Did you delete the photos on the phone? If you didn’t export the album as a album file or pdf file, the album will not work properly after deleting original photos. I have Story Album on my Samsung Galaxy S4. It seems like I might use it, but it has a problem with the notification of New Albums. Ever since it automatically created 2 new Albums, the icon on the main Page, and in a Folder, and within “Apps” shows a “2” in a circle (2 new Albums). OK, I know! I have tried everything I can think of short of de-installing the application to get rid of the “2”. What is the secret trick? (or, is this a bug?) Thank you. It’s not a bug. It’s just an annoying feature. You need check the story albums once. If there are any recommendations, you also have to apply or dismiss them. I lost all of my photo albums with this app. That is ridiculous. I was deleting one album and accidently deleted all of my albums. So mad I cried all of my pictures gone! Please help me retrieve them if you know a way. There are no way to retrieve unless you have backups. Back up if anything is important.